The word mutation doesn’t usually engender positive feelings. But molecular biologist L. Curtis Hannah’s work on mutations has provided an important development in the breeding of corn and other crops. Building upon previous scientific research, Hannah discovered mutations created by DNA movement from one point on the DNA strand to another point on the same strand. His discoveries included a series of small mutations that increased the amount of starch in corn by 15 to 20 percent. Further, he found that the first mutation, Shrunken2-Rev6 (Sh2-Rev6), gave rise to a 30 percent increase in the sugar content of ripened fruit, and doubled the amount of wheat production. In the past five years, Hannah has received more than $2 million in funding for his research through the National Science Foundation and the U.S. Department of Agriculture Competitive Grants Program. Hannah has been invited to speak at numerous universities and conferences around the world. 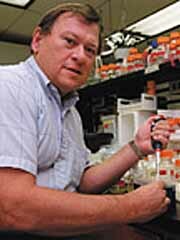 He served as one of the two founding directors of the UF Interdisciplinary Center for Biotechnology Research, a university-wide biotechnology center, and presently serves as director of the graduate program in plant molecular and cellular biology. In addition to this university service, Hannah has served on more than 15 panels in federal review panels, including the prestigious National Institutes of Health Genetics Study Section. A recipient of one of the original Professional Excellence Project Awards, Hannah was also the UF nominee for the Filippo Maseri Floria World Prize in Agriculture, a globally recognized award for excellence in agriculture.